As you know, I adore a statement piece. It doesn’t have to be loud, it doesn’t have to shine, it just has to bring the entire outfit together. This waterfall vest or waistcoat, as some may call it, is the prime spring and summer piece. I love it’s versatility because it can be worn with jeans, shorts, and skirts. It’s the perfect touch to my all white look. Also when thinking about a statement piece, it could be something as simple as a scarf. Going with the bandana trend, I added a white, paisley bandana around my neck for a little edge. 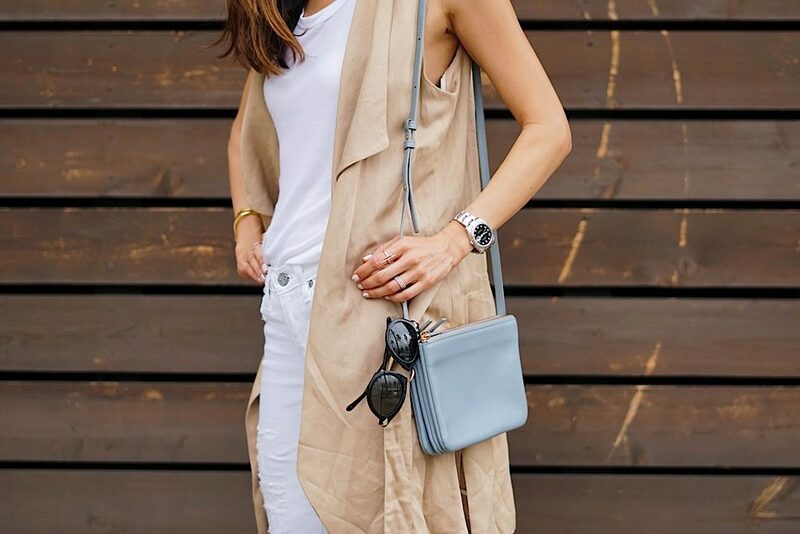 Because my outfit is so minimal and muted, I paired this ensemble with a gray/ blue crossbody bag to add a hint of color without overpowering the neutral color scheme.